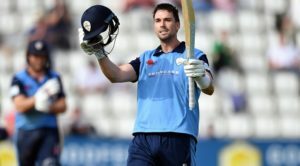 Wayne Madsen hit an unbeaten 204 and passed 15,000 runs in all formats for Derbyshire as he secured a draw for his side against Gloucestershire at The Bristol County Ground. In hitting his 29th first-class century for Derbyshire, Madsen also went past 10,000 first-class runs for the county to round off a day of milestones for the 35-year-old batsman. Beginning the day with a slender lead and eight wickets in tact, Alex Hughes (109 not out) also shone with a fine century, while Tom Lace (57) hit a half-century as Derbyshire batted throughout the final day to reach 388-3 declared. Lace was first to 50, off 112 balls and with six fours, reaching the landmark for the third time in four Specsavers County Championship innings. Unable to make it three consecutive career-best knocks, he was out to Benny Howell for 57, well caught by Chris Dent at fourth slip. This brought Hughes to join Madsen and after playing and missing Harry Hankins, he soon settled and set about building a big lead, taking the game away from Gloucestershire. Hughes pulled Hankins for six over mid-wicket and Madsen reached his half-century off 145 balls in an uncharacteristically defensive knock which was played to suit the situation. As the partnership grew, Madsen began to expand and in reaching 63, he scored his 15,000th run in all forms for Derbyshire. The landmarks came and went as he notched his 29th first-class century for the club shortly before the hosts took the new ball. Hughes looked equally fluent as Gloucestershire captain Dent turned to his entire bowling unit in hope of breaking the stand. 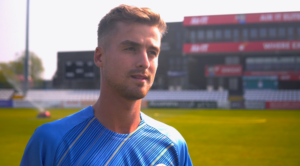 But the pair marched on, first Madsen went to 150, then Hughes reached his sixth first-class century for Derbyshire and the stand soon surpassed the club’s fourth-wicket record against Gloucestershire – previously 243, set in 1901. 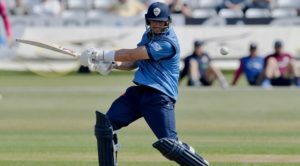 Far from second fiddle on any other day, Hughes scored around the wicket as Madsen turned to trademark reverse-sweeps against spin to bring up his double-century – the 50th by a Derbyshire batsman. Soon after the players shook hands on a draw, with Derbyshire declaring on 388-3 and an insurmountable lead of 329. The result leaves Derbyshire top of the Specsavers County Championship Division Two table on 28 points, as we now switch to a block of Royal London One-Day Cup cricket, starting with back-to-back home matches over the Easter weekend at The Pattonair County Ground.